Holiday Dinner With the Doc! 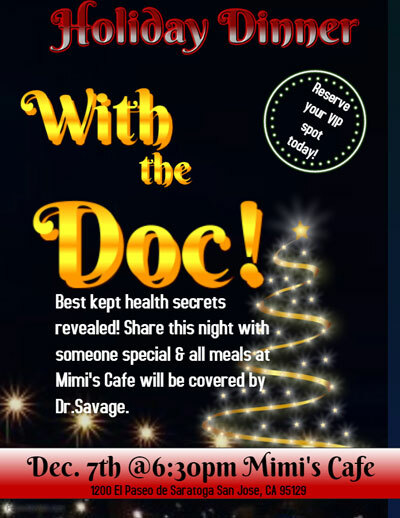 Wednesday December 7th, 6:30-8pm at Mimi’s Café. This is the opportunity for you to share the gift of health with your family friends. Bring a guest who is currently not a Chiropractic First patient and your dinner is complementary. We will be revealing the best kept health secrets as well as tips on how to end 2016 strong and create a healthier, happier 2017. *This is a first come first serve event; Reserve your spot today!